Even if you consider yourself well-educated when it comes to the pearl market, you may sometimes see a word that you don’t recognize: Hanadama. The Hanadama is a pearl classification which designates the very best of the best when it comes to Japanese Akoya pearls. Choosing a Hanadama pearl necklace is a way to guarantee that you are buying the finest Japanese Akoya pearls on the market. Unsurprisingly, Hanadama pearls are very rare. Only the top 0.1% of each year’s pearl harvest will receive this coveted designation. In order to be considered a Hanadama pearl, the luster and nacre of a pearl are closely examined. They have a mirror-like surface, with a bright, slightly rose-colored luster accumulated via the numerous layers of nacre that built up while the pearl was still in the shell. As a result, Hanadama pearls have an exceptionally thick nacre as compared to traditional Akoyas. While Hanadama pearls are the “cream of the crop” when it comes to Japanese Akoyas, this does not mean that Hanadama pearls are considered “perfect” or have surfaces which are completely flawless. Although Hanadamas are required to have surface blemishes of less than 5%, the truth is that no pearl is truly flawless. Pearls are gifts from nature, created inside the shells of living creatures. This makes each pearl unique, but outside the realm of true perfection. 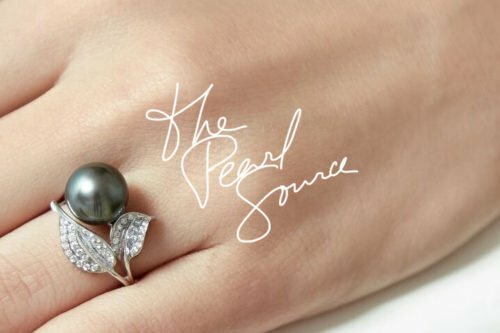 In fact, it is said that the only perfect pearl is an imitation pearl. But if you are looking for as close to flawless as possible, Hanadama pearls are the way to go.